In preparation for my relocation, I am relocating a lot of my stuff—either to the trash compactor or to the half-price bookstore. While I feel some natural attachment to the items I own, it is amazing what you’re willing to let go of when you ask yourself, “Do I want to haul this 600 miles over the mountains?” So, farewell to my VHS fansubs of the fifth season of Sailor Moon! Adios to my college linguistics textbook! And good-bye to the majority of my CD collection! When I was a kid, I would sometimes go through my dad’s record collection which took up two shelves of the living room bookcase. The vinyl discs were somewhat fascinating, and it was interesting to think of a time when this was the only way to purchase recordings of music. Looking at my hundreds of CD cases, I realized they are the 1990’s equivalent of my dad’s record collection. I haven’t used any of the discs since I ripped them to MP3 several years ago. When you put about 200 of them in a box, they get rather heavy. So I’ve decided to let go of most of them, excluding any CDs with interesting packaging or by artists I particularly like. As you can see in the photo above, I had them stored in a plastic storage tub. I bought several of these tubs after I returned home from a bridal shower one weekend to discover the toilet in the empty apartment above me had overflowed, thus ruining my entire Sandman comic collection. I’ve been paranoid about unexpected flooding ever since, and prefer to store things in waterproof containers in case the worse happens. It’s rather nice to be rid of the items. I don’t have to worry about losing them to water damage. Instead, I’m letting them go on my own terms. I totally get it. I moved across country a couple of years ago and parted with a majority of my possessions (knowing I’d be going from my 2-bedroom house in the ‘burbs to a Manhattan-sized studio). I did keep all of my CDs and DVDs, but got rid of their cases. I converted to storage in binders. I have well over a thousand discs, but now they fit nicely, taking hardly any room at all. A Kindle also helped replace some of my books (kept the favorites) and I have PDF versions of a lot of my paper music. It’s so freeing!! Definitely get rid of the VHS! ;) I did that last time I moved. I also bought a bunch of CD books so I could store the jewel cases in the garage and save space. I love having the books with all my CDs in it. My dad has an epic record collection. I loved looking at it as a kid! I moved from Montgomery, AL, to Atlanta, GA, in November 2009, and I pretty much left everything that couldn’t fit in my 2005 Toyota Corolla behind. I sold my grandmother’s bedroom suite that had been in my life for probably close to 20 years and was given to me when my grandmother, whom I was very close to, died. I sold my couch and loveseat, dining room set, washing machine, and etc. Threw out three HUGE full garbage bags of crap I’d held on to for way too long. Donated clothes, books, DVDs, and etc. When we moved to NC a year and a half ago we downsized from a two and half story victorian home to a 3 bedroom duplex. I took so many loads to goodwill before we moved. And since we’ve moved I’ve hauled so much more to goodwill. It’s amazing how much you really don’t need. Just FYI, if you sell or destroy the CDs, but keep the mp3s you’ve burned of them, you’re technically in violation of federal law. You may not care, and you’re certainly unlikely to be penalized, but if you do care, it is against the law to copy a CD and then get rid of the original. Man, oh man, I LOVE getting rid of “things” it’s a great cleansing process!! Wow. Sailor Moon Stars AND The Sandman? I think you just earned about three thousand points on my personal “Cool” meter. Congratulations! I’m sure this is very exciting for you. I’m only slightly embarassed to admit that I spent more than ample free time on eBay in 1998-2001 collecting ALL of the movies David Bowie ever made and, of course, most of them were only available on VHS. I’m gradually wrapping my head around the fact that it will make more sense to donate them to the local music and movie swap shop for another glam rock afficionado. As for MP3s, maybe this sounds like I’m 90 (actually I’m in my 30s thankyouverymuch), but I resist dumping my CDs. I have too many tunes I ripped to MP3, only to suffer with “broken links” and the inability to listen to the digital music without re-ripping. What gives? As someone who makes her living selling her copyrighted work, I’m going to say it more strongly than the previous poster. When you rip digital files and then sell the originals you’re committing a crime. You’re stealing intellectual property. If you get rid of the original CD, then you need to delete the ripped files from your computer or you’re doing nothing different than if you walked into a store, sneaked that CD into your purse, and walked out w/out paying for it. @Kara – So she purchased the CD. The only way to keep the MP3 files in your book is to hand onto the CD? I understand not selling them, but what about destroying them? I don’t imagine most people would do this, but I wanted to get your take on it –based on your post. @Kara–what if you donate the CD? 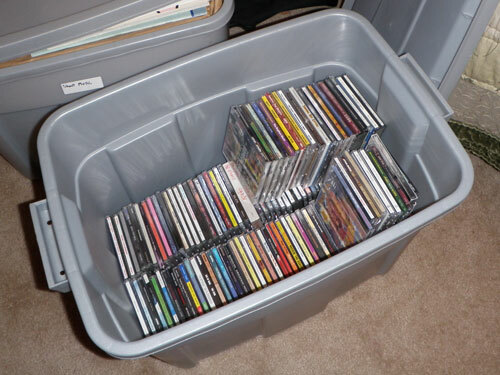 I have ripped most of my CDS to my hard drive and have a huge box of them that I am planning to donate to the library–is this still a crime? Re: copyright, you have to be able to reasonably prove that you obtained the music legally. The easiest way to do that is to have the CD you ripped it from, or to have purchased the MP3 with DRM (Digital Rights Management). That said, you can rip away for personal use, as long as you have the source. Sorta like taping your records. You are required to destroy the copy if you dispose of the source. I say reasonable, because you can possess a CD that you stole, rip it, and no one will require you to produce a receipt. Donations are not acceptable if you intend to keep the MP3. I learned so much from the replies from people who say to keep the CDs. But what happens when you have a serious clutter or hoarding problem? You still have to hang onto to all the CDs if they’re overrunning your life?